In 10-inch skillet, heat oil over medium-high heat. Add beef. Cook, stirring frequently, about 3 minutes or until golden brown; reserve in medium bowl. In same skillet, cook onion about 3 minutes or until brown. Add tomato, beef, soy sauce, vinegar and pepper. Cook 2 to 3 minutes or until liquid has evaporated. Remove from heat. Cool 5 minutes. On lightly floured work surface, roll each pie crust into 14-inch circle. Using 6-inch round plate, cut 3 circles from each crust. Reroll remaining dough, and cut 2 more 6-inch circles. Moisten edge of each circle with water, and place about 2 tablespoons filling on circle. Fold dough in half over filling; press edge with fork to seal. On ungreased cookie sheet, place 2 inches apart. Poke top of each once with fork to vent steam. Bake 10 to 12 minutes or until light golden brown. Cool 10 minutes. Store leftovers loosely covered in refrigerator. 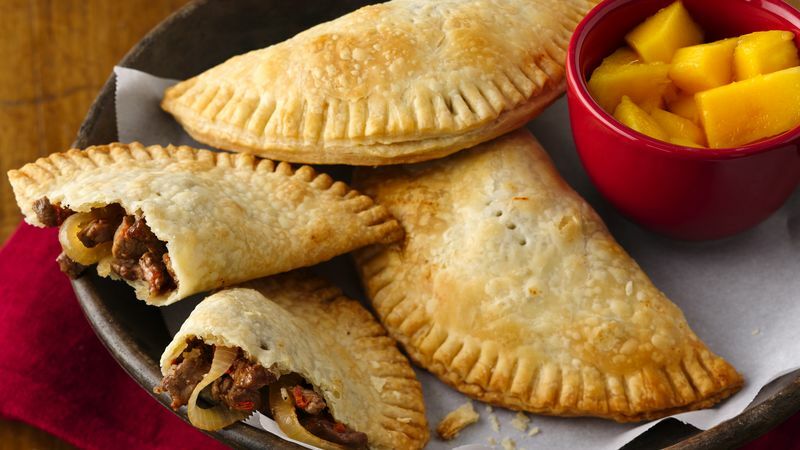 Serve these delicious empanadas with a salad for a complete meal.